Seven Days of Us is the debut novel from journalist Francesca Hornak and it’s a very compelling read. The Birch family are spending Christmas in their rambling country house in Norfolk. It’s the first time the family have spent Christmas together for some time since elder daughter Olivia is a doctor and often working. Sounds idyllic doesn’t it? Well, not really since the family cannot leave the house at all for seven days and can’t have anyone visit them either. Olivia has just returned from Liberia where she has been working with patients with the deadly Haag virus and as a result the whole family are in quarantine. Although most people look forward to Christmas and spending time with their family, we all know that it can also be a very stressful time. This is certainly the case for the Birch family. All the tensions which could normally be smoothed over cannot be avoided as they have no choice but to spend Christmas together. Parents Emma and Andrew used to be so close but don’t seem to communicate so well anymore. Both have secrets they don’t want to reveal, or at least not at Christmas. But one of those secrets is going to make its presence felt very soon and turn the family dynamics upside down. Olivia and her sister Phoebe are very different and always have been. Both sisters have relationship worries this year but for very different reasons. Olivia’s relationship is one that shouldn’t really have happened and Phoebe, though very recently engaged, does not feel as ecstatic as she feels she should. Old resentments surface quickly as the sisters almost revert to childhood behaviours. I really enjoyed the structure of this book. Set across the seven days of quarantine, as each day goes on the reader hears about what is happening from each of the main characters’ points of view in turn. This helped me to really get to know the characters and understand them better. All of them seemed fully rounded and although all had traits which were irritating, they all had redeeming qualities too. The author has brilliantly created a sense of tension and claustrophobia throughout as the family rub each other up the wrong way and as they try – and mostly fail – to keep their secrets. It’s also quite funny in places and I’m sure that many people will recognise themselves or members of their own family amongst the characters. 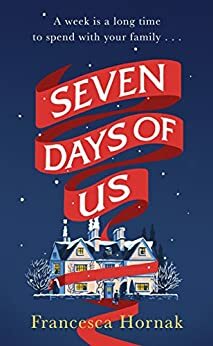 Seven Days of Us is a book which could be enjoyed at any time of year, not just Christmas. Christmas isn’t the main focus of the book, the family forced to be together and coping with all the secrets tumbling out is the focal point. It’s not your typical cosy Christmas read full of tinsel and snow and neat happy endings but it’s certainly an enjoyable and warm hearted read.